Need more information about booking Home 61967 ? Our apartment is a ground floor corner apartment right beside the pool. There is a large wrap around south facing terrace with table, chairs, sun loungers and BBQ. A separate terrace can be accessed from the master bedroom. This terrace is facing southwest and is furnished with a table and chairs and is only a few feet away from the pool. The terraces are tastefully planted with climbing plants and shrubs and have golf, sea and fantastic mountain views. There is secure underground parking with access to the apartment via stairs or lift. The doors and windows are fitted with traditional wrought iron ornamental gates and each has a roll away aluminium blind for extra security and to shut out the sun keeping the apartment cool. The apartment is fitted with a video entry system which controls access from within and there is also a safe which guests may use. The apartment is also equipped with a fire blanket and smoke alarms. The apartment is finished to a very high specification and has marble floors throughout, granite worktops in the kitchen, built in wardrobes in each bedroom and is furnished with high quality modern furnishings. A climate control system provides either air conditioning or heating throughout the apartment as appropriate. Local bus route no M103 services the development. There are stops near the apartment and the bus will take to our White village , Benalmadena Pueblo in one direction and to the town of Arroyo de la Miel in the other direction and then on to the coast. Our guests will receive lots of information about the area before their holiday and although we won`t personally be on site during their stay in our apartment we will always be available to contact if they need any advice or help during their trip. We know the area very well and are happy to advise on attractions, activities, places to visit, bars and restaurants etc. Guests are responsible for all keys , including garage and pool keys during their stay. Missing or lost keys could result in locks having to be changed and will be charged for. This is a really nice well proportioned and well equipped secure apartment. The apartment had everything we needed in terms of kitchen equipment, sun loungers, chairs, tables. The pool was right next to the balcony and easy accessible. We had rain one day but this wasn’t a problem as we just sat on the part of the balcony under cover. The mountain views from the balcony are stunning. We found the complex really quiet and relaxing and took full advantage of this on some days. On other days we just took the bus down to Arroyo to visit some of the bars and restaurants we are familiar with. The communication from the property owners was second to none throughout our stay, all instructions were very clear and nothing was too much trouble. We will definitely be returning next year at some point and would have no hesitation in recommending this apartment. Response from the owner The complex is residential so the pools really only get busy in the evenings or at the weekends.The local bus is reliable and cheap and you can be in town or in the village within ten minutes to enjoy an evening out then retire to the tranquility of the apartment for a nightcap on the terrace afterwards. Thank you very much for you review and we look forward to being able to welcome you back again soon. Was just what we needed a relaxed, chilled out time in the sunshine. Plenty to see & do if that is your thing. We did a little bit of sight seeing going into the white village and took the bus into the marina area & had dinner one night. Other wise we made the most of the apartment & it’s facilities sun loungers, BBQ, pool. Robert & Ellen have the place kitted with everything you could need. The welcome pack was a lovely touch and provided us with enough to eat until we got to the Mercadona. We had such a great time we have booked to go back next year. We spent a few days at this apartment and had a fantastic stay. The apartment is beautifully kept and spotlessly clean, is equipped with everything you can need and is well located for exploring the surrounding area. Even in October we made good use of the excellent gas barbecue on the spacious terrace and enjoyed the view of the mountains as we chatted over breakfast each morning. We didn't use the shared pool which is just beside the terrace but I can imagine it being very popular with families with children. I would recommend hiring a car to get around (there is secure underground parking) although there is public transport to get to the beach area, the Pueblo or the cable car to go up the mountain. All in all a great holiday destination on the Costa del Sol. Response from the owner We are pleased that you enjoyed your stay at our apartment. The development is on the urban bus route so the local attractions are only minutes away. However we also recommend that our guests consider car hire for both their convenience and to explore the local area as there is just so much to see. Thank you very much for your review and we hope that we are able to welcome you back soon. We spent a fantastic week in Robert & Ellen's apartment.. The apartment was well equipped even down to a shopping trolley in the kitchen which we used more than once as the nearest supermarket was 20 minutes away. The surrounding area was stunning. There were lots of information in the apartment of places to visit, Mijas been our favourite. Thank you for our arrival pack which was much appreciated. We would definetley recommend this to family and friends. Response from the owner We are pleased that you enjoyed your holiday and that the information we provided was helpful. Mijas is a very beautiful village with narrow streets and hidden gems which make it fun to explore. It is also very easy to get to from Benalmadena using local transport. Thank you for your review and we look forward to welcoming you back in the future. This was our first stay in this apartment although we have rented on several occasions within the Arenal Golf development. The owner provided us with extensive helpful local information prior to travelling and was available for support throughout - should we have needed it. The apartment was modern and well equipped with plentiful towels; even small things e.g. washing up liquid and washing powder was available. The apartment itself is located beside a swimming pool. Although there is a bus which services Arenal Golf we found we did need a car. In conclusion - we would rent Robert and Ellen's apartment again. Response from the owner We are glad that you enjoyed your stay. Lots of our guests choose not to hire a car and are happy to use the local public transport, however we always recommend that they consider hiring a car for at least part of their stay. We suppose it depends on what you want to do during your holiday. Thank you very much for taking the time to write a review and we hope to be able to welcome you back again soon. Having done the whole package holiday thing for years, self catering and all-inclusive, we decided to rent a private apartment for something different, and we were so glad we did. This apartment has absolutely everything. This finish is first class, and has everything you could wish for. The information that the owners provide you with, from a couple of weeks before you fly, and ensuring you arrive safely would put travel companies to shame. You do need transport when you are there, but you can get a bus into town cheap enough and a cab back in the evenings won't break the bank. The Arroyo is fantastic, and the Pueblo is just stunning. After the way we have been looked after and the comfort in which we stayed, our days of package holidays are long behind us, we will definitely be back to this fantastic venue. Response from the owner We are sure that you were a bit nervous about your holiday as this was the first time you`d tried self catering in an apartment so we are really pleased that you enjoyed the flexibility that it provides against a hotel stay. Thank you for taking the time to write such a nice review and we look forward to having you back with us again soon. 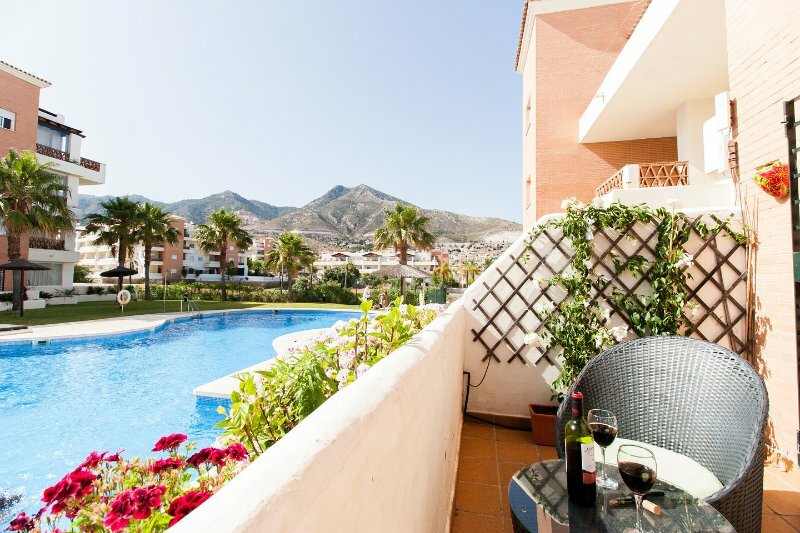 Response from the owner We love Benalmadena because there is just so much to do and see in the area and we are pleased that by staying in our apartment you were able to experience and enjoy an area of the resort that you may otherwise have missed. Thank you very much for taking the time to write a review it is very much appreciated by us both and we look forward to receiving you back again soon. From the moment we booked this apartment, I knew we wouldn't be disappointed as Robert and Ellen keep me up-to-date on everything I needed to know about the apartment before and during my holiday. Robert and Ellen also provided us with information regarding the complex and surrounding areas. When we arrived, we were met at the apartment by Joe who showed us around the apartment, she made us feel at home and informed us of the welcome pack, which was greatly appreciated after a long day of traveling! This apartment was like just being able to bring your own home on holiday with you! We settled in quickly and we felt at home instantly. Having two teenage boys the WI-FI was a great addition to the apartment as was the 'Sky TV' in the bedroom. The iPod docking station also got plenty of use. It was also a great addition to have the use of the shopping trolley which made trips to and from the supermarket easy. That was certainly the case, when bringing the fresh meat back to the apartment for an evening BBQ on the terrace. Robert and Ellen also provided us with an extra gas cylinder for the gas barbecue should we run out. Having the pool so close to the apartment was great, you literally had to walk a few meters out of the apartment, and you were there! This was our fourth year in Arenal Golf, and this apartment was by far the best we have ever stayed in. Robert and Ellen suggested that we visit the newly opened club house which served great food and drink at a reasonable price. The bus service in the area was fantastic, it was cheap and always on time for trips into Arroyo or the Marina. There is also a bus service that takes you in the opposite direction into the beautiful village of Pueblo which is definitely somewhere you want to see! We were provided with a taxi number in the apartment, which was quick and easy to use. Throughout our holiday we knew that Robert and Ellen were only a phone call away should there have been any problems. This apartment is top class as mentioned in the title and we would 100% recommend this apartment to family and friends. We will definitely be booking this apartment in the near future. Thanks again Robert and Ellen for the fantastic service you provided. Response from the owner Thank you so much for your very kind review of our apartment. We really appreciate the fact that you have taken the time to sit down and write this and are glad that the information we provided was helpful and that you all enjoyed your stay. We look forward to welcoming you all back again soon. Thank you again. This Apartment is everything you could want for a relaxing family holiday. The pool is right outside the window! There's a play station , dvd's , books , games , English tv channels , towels are all provided , two bathrooms , etc. And if you can tear yourself away then you can have peace of mind because it's very secure-there's even a safe for your valuables. It's also ideally located between the quiet beautiful pueblo with it's delicious fish restaurants and stunning Arab market ( only on certain days) and then in the other direction you have the busier centre of Arroya with it's mixture of tapas bars and international restaurants. And if that's not enough , go a little further and you'll find a world class marina with even more. For the attractions we can only comment on the ones we used-Selwo was very good for the Dolphins but was a little disappointing otherwise , we also went to Gibraltar -approx 1 1/2 hours away and this was fantastic-do the full tour-you'll see everything . Been to Spain many times in last 20 years and this is the best Apartment we've stayed in Looking forward to coming back. Thank you Robert and Ellen. Response from the owner We really appreciate your review of our apartment. It`s always nice to get away on holiday and spend quality time with your family or partner. We believe that having comfortable accommodation where you can relax and feel at home after a tiring day out is also vitally important and we try our best to provide this for our guests. We`re so glad you had a great holiday and we look forward to seeing you again soon. Many thanks again. My family visited the lovely 2 bedroom apartment for a 10 day visit in July. The owner had supplied us with lots of information about the resort and the facilities before we went which was really useful. The apartment was nicely furnished and had all mod cons (washing machine, dish washer, satellite tv, ipod docking station, etc). The complex itself was quiet and secure with a decent sized swimming pool. We rented a car and I would suggest that it is essential to have one. The local beaches are lovely and there is lots for older kids to do. We visited tivoli world and aqualand. Response from the owner Thank you for reviewing our apartment. We are glad that the information we provided was useful and hopefully it helped you plan what you wanted to do and see during your stay. You are right about a car and we always recommend that our guests consider this when they first enquire. Unless you know the area well and are familar with the buses we feel that a car is neccessary. You can get in touch with Robert & Ellen (the owner) through the contact form on this page. Send Robert & Ellen (the owner) an email through the contact form on this page. Alternatively, if there’s a phone number on this page, you can call them. How do I contact Robert & Ellen (the owner)? You'll need to send Robert & Ellen (the owner) an enquiry to book - the owner will let you know how to pay. If they accept online booking they'll send you a quote and info on how to pay. If you pay through our website you’ll be covered by Payment Protection. Or you can send Robert & Ellen (the owner) an enquiry through the contact form to request a quote. Robert & ellen (the owner) will email you the total cost for your dates and how to pay. Send Robert & Ellen (the owner) an enquiry through the contact form requesting a quote for your holiday dates. Robert & ellen (the owner) will email you the total cost for your dates and how to pay. Robert & ellen (the owner) of this property is responsible for taking and refunding your damage deposit. The damage deposit terms should be agreed before booking and outlined in the booking contract, if Robert & Ellen (the owner) supplies one. Please refer to these details or contact Robert & Ellen (the owner) directly if you have any questions. You'll need to contact Robert & Ellen (the owner) to cancel. They should have provided their contact details when you made your booking - otherwise, email them through the contact form. You'll need to contact Robert & Ellen (the owner) to edit your booking. They should have provided their contact details when you made your booking - otherwise, email them through the contact form.